#Click on image to enlarge. 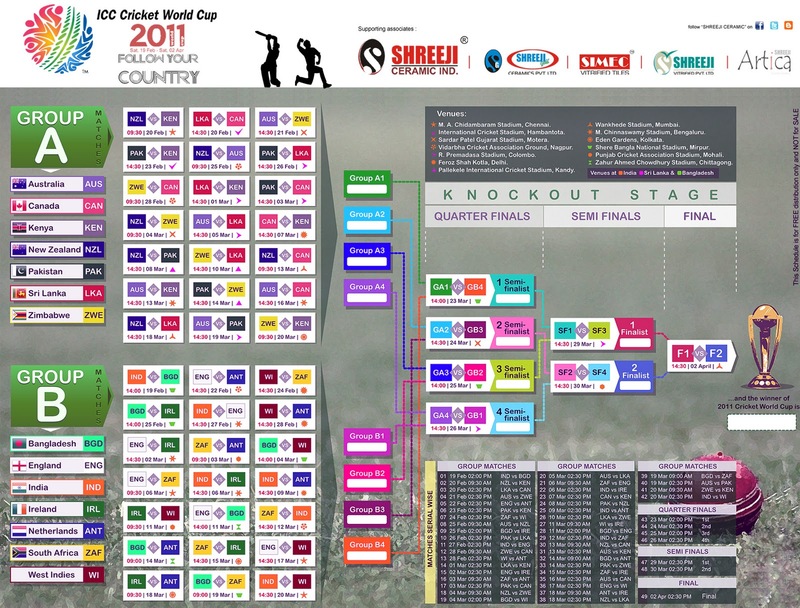 This schedule is for FREE distribution only and NOT for SALE. 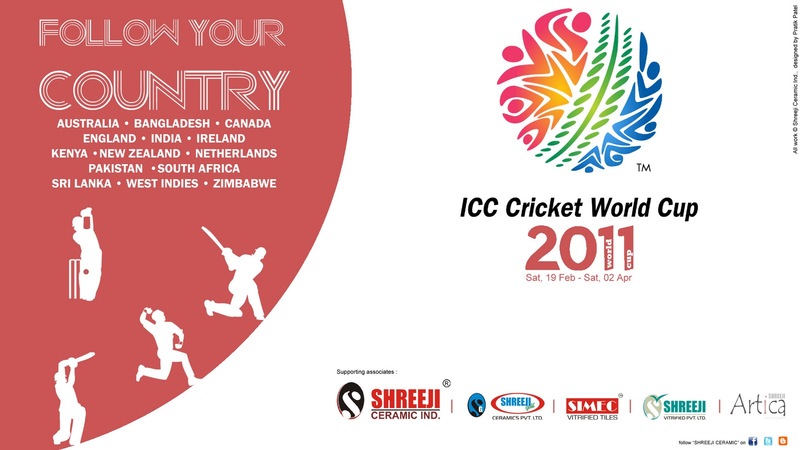 Join us on Facebook | Shreeji Ceramic and comment on Follow Your Country contest for this ICC Cricket World Cup 2011. *Best commenter would get surprise gift. SHREEJI Artica is a small art gallery; that is becoming increasingly popular among applied art collectors. Its founder, Pratik Patel and his group have been doing a great selection job over the last couple of years; will present the works of modern art with a constant eye on quality. The objective is to give a good home to applied arts, which are often considered secondary to fine arts in India. Unique art facts where ancient techniques shaped in very modern shapes, where the designs are never casual or fortuitous results, where everything is harshly creative. The time to start “Artica” was certainly not a good pick, considering limitation and demand in India. However SHREEJI has managed a lot to build a good reputation in very short time, thanks to quality of product and the system of service. >Art Tile, with its timeless demand . . .
Hand painted tile has been used for centuries in countries around the world. From brilliantly colored and solid Spanish tiles to customary blue and white delft tiles, ceramic attractive tile has a number of uses. Art tile was first created in the 14th century in Spain and Portugal. The tiles were first one color, and used in a checkerboard model for chess boards. Enhancing patterns, pictures and friezes were added and as the reputation of the tile grew, exteriors and interiors of homes began to be tiles with the pretty attractive patterns. Where Can Art Tile Be Used? Be sure to keep the desired area to be tiled in mind when purchasing art tiles. If the area in question is a floor, be sure that the tiles are rated for floor and will not crack from pressure, or be overly slippery when wet. Thicknesses of art tiles can vary greatly, so be sure to keep that in mind when preparing the substrate, or combining art tiles with other materials. Posted on January 30, 2011 March 11, 2011 Categories UncategorizedLeave a comment on >Art Tile, with its timeless demand . 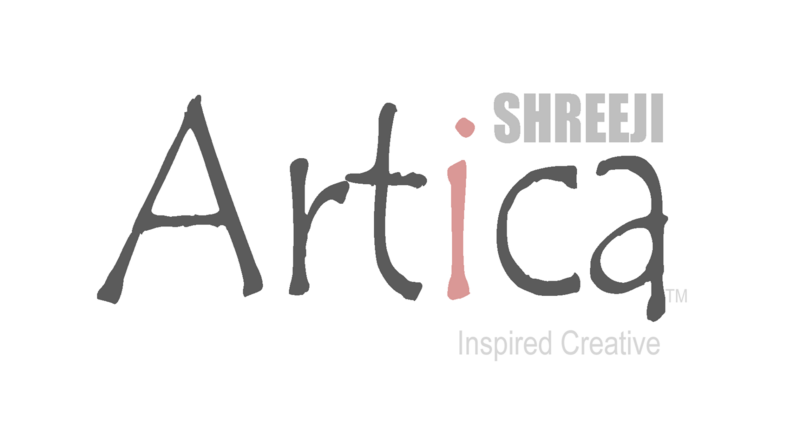 . .
SHREEJI ceramic, the foremost ceramic manufacturer, has publicize today (Wednesday, January 19, 2011) the launch of “Artica”, a high-fashion brand name that caters to the needs and contemporary demands of its rising group to elite clientele in key markets around the planet. Aiming a high value role bazaar, “Artica” provides as a sublime hub whose unmarked impression opens fresh creative possibilities and expands the scope for innovation to assure the unique inventive demand of superior customers who are willing to spend a premium. Shreeji Ceramic is eager to encourage the immense potential of such a fashion, innovation and style. “Artica” feature a distinctive fusion of art and fashion through an extensive range of concept designs created by Pratik Patel, BDM, Shreeji Ceramic. The launch of “Artica” expands our capacity for inspiration and modernization, which will seal our standing as a principal leader and fashion icon in the ‘going global’ Indian ceramic industry. Posted on January 18, 2011 March 11, 2011 Categories UncategorizedLeave a comment on >Shreeji Ceramic Launches "Artica"
If a basic, single type of tile design isn’t your cup of tea then SHREEJI Artica™ team could be the best place to contact. Our aim is to make people aware of latest trend and ideas for innovative homes and corporate. We assist people with their own designs and choices, and let them create their imagination in realism. Combining styles and patterns of ceramic tiles with floor and wall products can give a room a unique and aesthetic balance. Wall tile style usually come in smaller size and with higher gloss, and large floor tiles are designed to adhere to walls. 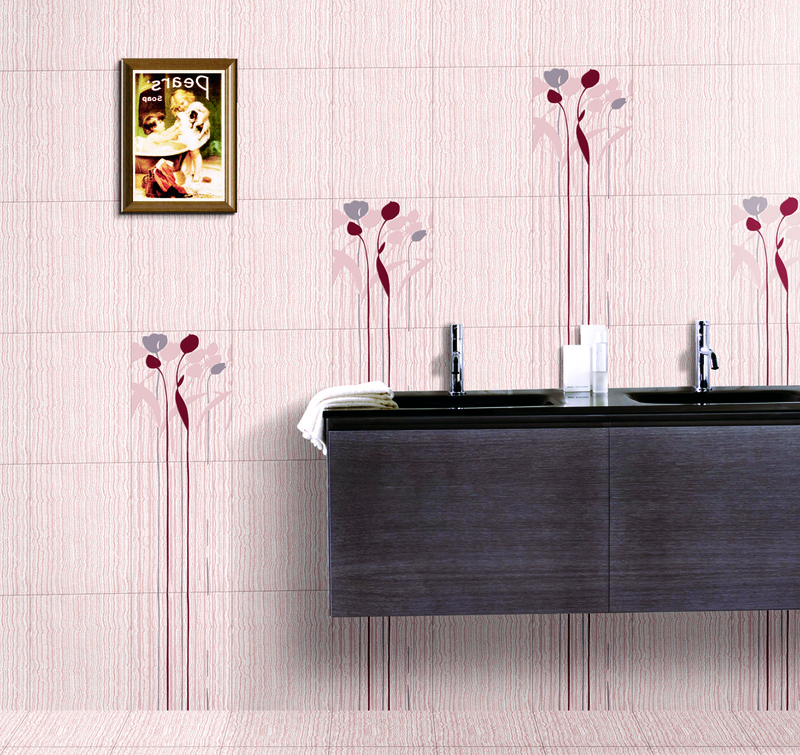 Use of multiple tiles to create a colored, textured mixture with a personality all its own. Likewise, put your ties in a bag, and smash them to pieces with a hammer to create little tiles of different shapes and sizes. Now you are free to put in random way within anyone’s imagination. In addition to styles, we also provide decorative tiles that can be used to create intricate patterns and borders. Patterned borders comprised of different size tiles or different colors can create timeless looks. Simple variations in color, shape or size can be patterned within the same room or across several adjoining rooms. The tile that is most prominent throughout the largest areas is called the SHREEJI Artica™. >Why Social Networking is Important For Your Business? >Social networking is probably the most significant business development of 21st Century. During the year, social networking morphed from a personal communications tool for young people into a new vehicle that business leaders are using to transform communications with their employees and customers, as it shifts from one-way transmission of information to two-way interaction. A year ago, many people poked fun at Facebook as a place where kids shared their latest party news. Today more than 600 million users worldwide are active on the site. The most rapidly growing demographic is people over forty. More than 300 million people spend at least one hour a day on Facebook. Approximately two hundred million people are active on Twitter in spite of – or because of – its 140-character limitation. Another 100 million use LinkedIn. None of these social networks even existed at the beginning of the decade. Many top leaders are active social network users. Why? Because these social networks are a unique way of broadly communicating real-time messages to the audiences they want to reach. They can write a message anywhere, anytime, and share it with interested parties without any public relations meddling, speech writers, airplane travel, canned videos, or voicemail messages. Now their words are much more authentic and can be remarkably empowering. In fact, brands who take on board the criticisms they hear on Facebook, Twitter or through social media monitoring, and then try to improve on them, will be the ones who continue to grow and prosper. Every single piece of information that is picked up online, be it good or bad, is a valuable learning. Posted on January 8, 2011 Categories UncategorizedLeave a comment on >Why Social Networking is Important For Your Business? Tile has been around for a long period of time. Tile was used as far back as ancient Greece and Rome. The tile at that time was mostly made of marble or other polished stones. The Tiling used in homes today is mostly made from ceramic. Ceramic is somewhat inexpensive to wears well in homes and is impressive that most people are willing to pay to have installed in their homes. Tile consisting of marble is very expensive and is not used in most homes. Like everything else in home décor, the trends for tile flooring have changed gradually throughout the ages when it comes to design, quality and materials. When considering tiles materials for various rooms in the house, for the kitchen and bathroom many people choose due to its durability, beauty and resistance to water and humidity. When ceramic materials are installed and cared for properly, they can last the life of the house and maintain their appearance.